As a fashion blogger, I’m always looking to find the latest trends in the fashion world to give you guys, my incredible followers and friends, the latest and greatest and where to buy them. This is probably one of my favorite trends, which luckily I think is staying around for a while! The Bomber Jacket is definitely a staple piece, must have, for any fashionista’s wardrobe. You can rock it with a pair of skinny jeans for a casual fall look, or even with a pretty dress to give it an edgier feel. What’s cool about bomber jackets is that you can personalize them as much as you like. Some come plain, with a couple of patches, or full of them! You can get as creative as you want, which is what I think attracts me most to this trendy piece. Everyone’s favorite season is coming back … FALL is here! I’m so excited for Fall fashion to be in full effect, even down here in Miami. Lucky for me, there’s an online shop (website coming soon) that sells affordable pieces for tweens and teens, and their fall collection is to die for! I styled this gorgeous slate gray sweater dress for a coffee date in Coral Gables with a pair of black booties and a leather jacket. It doesn’t really get too chilly down here, but dressing for fall is too much fun! Make sure to check out @MinnowandMars on Instagram to get your daily fashion inspo and watch out for their website launch! Last week going to eat at that yummy spot, Dirt was so much fun. What I didn’t mention to you guys was after eating my delicious and healthy meal with the family, I was able to stay at this gorgeous hotel right on Collins Ave, The Hall South Beach. This hotel is the definition of Miami: super art deco, modern, beautiful, and right by the beach! We had so much fun. When we got there, after check-in of course, we walked to our room which was on the first floor. The best part about our room… POOL ACCESS! Our back doors opened right to the pool area – it was AWESOME! My brother and I were pretty stoked about that, to say the least. Once we got onto the pool deck, we noticed these super cute cabanas that were empty. Typically, when you visit any hotel here in Miami, cabanas are either not available or super expensive to rent out. That is not the case for this hotel. The cabanas at The Hall are included in your nightly fee, which works out GREAT for families! The next morning we had a yummy breakfast at the hotel’s restaurant, Sunny’s. I had my favorite food in the world, an acai bowl (of course!). After breakfast, we explored the hotel a bit more and came across a fun little game area. A life size Jenga set, giant dice, it was really cool and a perfect picture spot! It was a Sunday well spent with my family, indeed. I loved the hotel and loved the area. I’m already nagging my mom to take us back! Hopefully before 2016 is over! Mia Vazquez aka "The Petite Poet" is Miami's youngest fashion and lifestyle blogger. Since launching in 2013, Vazquez has made a name for herself through her charismatic and educational style post which teach kids and moms the basics from how to dress on a budget to what today's trends and more importantly how to embrace your inner beauty. 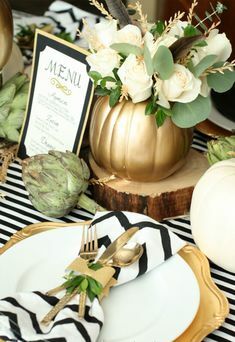 Everyone will love these black and white place settings. 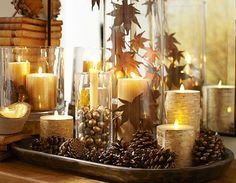 How-To Warm up Your Thanksgiving Décor • Tips & Ideas!